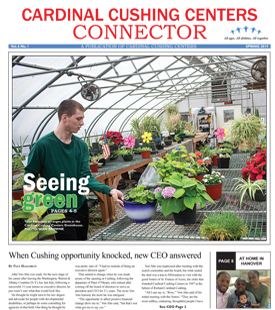 Thank you for your interest in Cardinal Cushing Centers. Choosing the right school can be one of the biggest decisions your family will make. The admissions staff at Cardinal Cushing School are here to help you learn more about all that our programs have to offer. While browsing our website you will see that the Cardinal Cushing School serves a diverse population of students. Many of our students have some developmental or intellectual delays covering the spectrum of functioning levels and more than half of our students are on the autism spectrum. Many of our students may have secondary conditions including behavioral, emotional, mental health or medical concerns. We have a rolling admissions policy which allows student enrollment at any time during the calendar year. We are also SEVIS approved which allows us to provide I-20 Visas to international students. Cardinal Cushing School makes a deliberate effort to give sincere consideration to each and every application we receive. We hope that you will take the time to learn more about us. Please contact a representative from the admissions office to coordinate a tour.